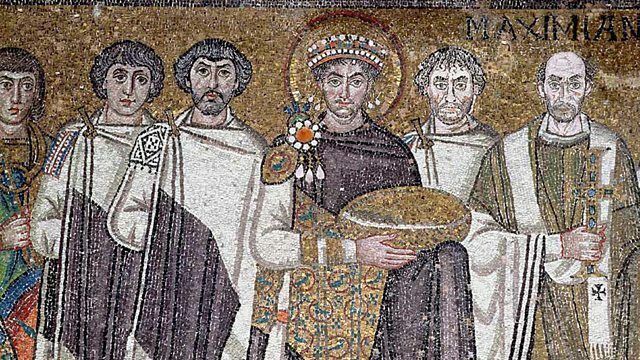 Melvyn Bragg discusses the culture, history and legacy of the eastern Byzantine Empire, and examines why it has so often been sidelined and undermined by historians. Melvyn Bragg and guests discuss the culture, history and legacy of the eastern Byzantine Empire. In 453 with the Barbarians at the gate, through the gate and sacking the city of Rome “the wide arch of the ranged empire” finally began to fall...Or did it? In AD 395 the Emperor Theodosius had divided the vast Roman Empire between his two sons. The Northern and Western Europe provinces were governed from Rome, but the Eastern Empire became based on the Bosphorous in the city of Constantinople. And when Rome crumbled and the Dark Ages fell across Western Europe, the Eastern Roman Empire endured, with its ancient texts, its classical outlook and its Imperial society…for another one thousand years. How did the East survive when the West fell, were they really Romans and why do we know so little about one of the most successful and long lived Empires ever to straddle the globe? Did its scholars with their Greek manuscripts enable the Western Renaissance to take place? And why has it so often been sidelined and undermined by history and historians? With Charlotte Roueché, Reader in Classical and Byzantine Greek, Kings College London; John Julius Norwich, author of a three part history of Byzantium: The Early Centuries, The Apogee and Decline and Fall; Liz James, Senior Lecturer in the History of Art, University of Sussex. Browse the Dark Ages era within the In Our Time archive. Browse the Ancient Rome era within the In Our Time archive.